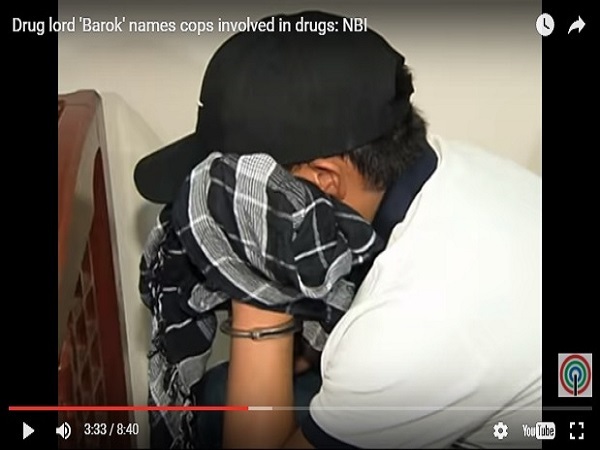 A top drug suspect who surrendered to the NBI (National Bureau of Investigation) has reportedly spilled the beans on police officials involved in the illegal drug trade. Alleged drug lord Alvaro "Barok" Alvaro surrendered to the NBI in Tagbilaran, Bohol, after his fellow drug suspect Jeffrey “Jaguar” Diaz was killed in a police operation in Las Piñas last week. Alvaro surrendered because he feared for his and his family’s safety as authorities were already closing in on him, said National Bureau of Investigation (NBI) Regional Director Attorney Jojo Yap yesterday (25 June 2016). He told ANC's Dateline Philippines that "Before the surrender of Alvaro, we actually imposed on him that before we facilitate the surrender, he should cooperate with us,". Barok is reportedly the one of Diaz's next-in-command in the province of Cebu. Yap said Alvaro has given "a lot of valuable information on his network and his network of his competitors," based on interviews by NBI agents. Though Yap refused to give the names of the police officials tagged by Alvaro, he confirmed there were several cops on the list. "I don’t have the exact figures right now, but he mentioned several names, and unfortunately, I can’t tell you the names right now because we are trying to validate and confirm those information," he said. The list, however, does not include the names of alleged high-ranking protectors of Diaz and Alvaro. "There were no names given as protectors because according to Alvaro or ‘Barok’, it was actually Jaguar who handles that aspect of their operation," he said. Although no colleagues of Alvaro have sent surrender feelers, Yap said the list provided to them would be helpful in their campaign against drug operations in Cebu. Meanwhile, Alvaro has been transferred to the Cebu Provincial Detention and Rehabilitation Center after a decision from the courts. Yap said he presumes Barok is "safe there."